The Ayers farm is home to 1,700 acres of crops and 600 milking cows and has been in the Ayers family dating all the way back to Andrew Jackson’s time — they have the sheepskin deed to prove it! The farm has grown over the years, but cow care remains a top priority — it just takes a few more helping hands. Are the practices different on a small farm versus a large farm? Kathy: The practice doesn’t change. Farms that have 20 cows to farms that have 2,000 cows – the cows come first on every farm I’ve ever been to, and that’s why they’re successful. On the larger farms, there are just more people involved. For us, I think we’re more efficient being a little bigger than some. Does the size of a farm relate to how successful it is? Kathy: People have to have the farm that works for them. Some people are equipped to run a small farm well, and some people are equipped to run a large farm well. You have to find what feels comfortable for you. There are multiple ways to farm, but we all need to come together if we want to feed our population. Dairy farming is an around the clock job. Do you have time off the farm? 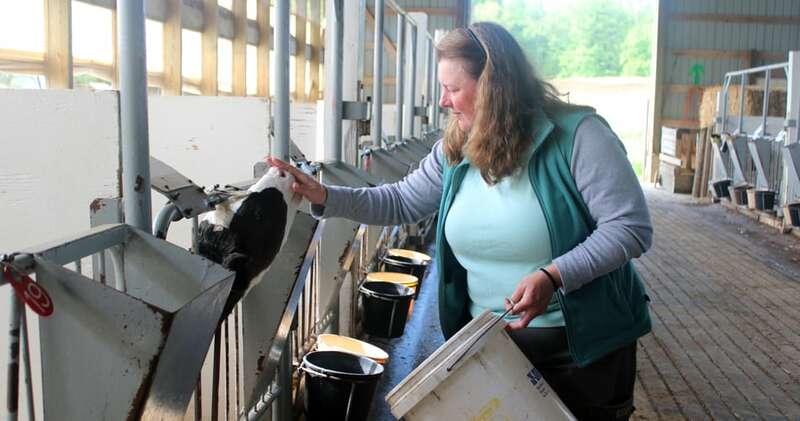 Kathy: Our farm supports six family members and 25 employees, which allows us to work around each other’s schedules to still have time off with our families. We are also involved in various activities with our churches and local libraries and host farm tours to special groups. Time off the farm with our family and friends is just as important as time on the farm.